Hardys Stamp of Australia Sémillon Sauvignon Blanc is a popular Australian White Wine available from Tesco Wine in 75cl to buy online. Visit Tesco Wine for the best price for 75cl of Hardys Stamp of Australia Sémillon Sauvignon Blanc or compare prices on our other Australian White Wine products. This release Semillon Sauvignon Blanc is crafted from grapes sourced from South Eastern Australia. This classic blend combines the grassy impressions of Semillon with the gooseberry lift and fleshy texture of Sauvignon Blanc. These two varieties are perfect complements for an uncomplicated, ‘drink now’ wine. Where to buy Hardys Stamp of Australia Sémillon Sauvignon Blanc ? Hardys Stamp of Australia Sémillon Sauvignon Blanc Supermarkets & Stockists. 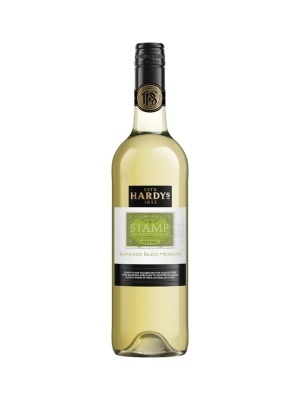 You can buy Hardys Stamp of Australia Sémillon Sauvignon Blanc online in most retailers and find it in the Australian White Wine aisle in supermarkets but we found the best deals online for Hardys Stamp of Australia Sémillon Sauvignon Blanc in Tesco Wine, DrinkSupermarket.com, and others. Compare the current price of Hardys Stamp of Australia Sémillon Sauvignon Blanc in 75cl size in the table of offers below. Simply click on the button to order Hardys Stamp of Australia Sémillon Sauvignon Blanc online now.